I am really good at rotating my running shoes. I never wear one pair of running shoes for more than a day in a row EXCEPT when I get a new pair. Then I can’t help myself from wearing the new pair of running shoes a few days in a row because I am so excited about how new they feel. I wore my new pair of Energy Boosts four days in a row this week but I promise I am back to rotating now that I got it out of my system. 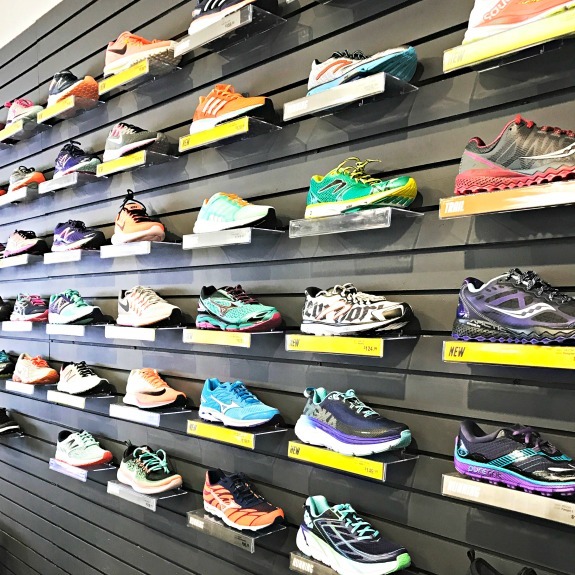 Last week when I went to Runner’s Edge for the new pair of Energy Boosts, I had the itch to try on a different pair of running shoes. I knew this would only cause confusion and I wouldn’t actually switch but sometimes, I want to try something else, you know? I tried on the Saucony Freedom. First, let me just say that the Saucony Freedom are BEAUTIFUL. The pictures don’t even do these shoes justice. The shade of turquoise combined with the rainbow bottom…I was in love! I notice the beauty of running shoes even more than the average runner since I have been running in Energy Boosts for so many years which basically means plain, boring and um, not pretty. The Saucony Freedom felt like heaven at first, until I felt my heels. I knew right away that the heel drop was too low for me. Even without fully understanding such technical lingo, I informed the running shoe person helping me that the heel drop was too low for me and that I needed at least 8 mm to be comfortable. Seriously, I have no idea what I just said, I just know that less than that many millimeters in my heel causes me heel pain in both feet. Turns out the Saucony Freedom are at a 4 mm drop. See! I knew what I was talking about without understanding what I am talking about! If you don’t have heel drop issues and like running in a neutral shoe, I definitely recommend trying the Saucony Freedom. They are a neutral shoe, really light but a good amount of cushion. I wish I could have tried to make them work for me. Notice I keep saying “try”. Running shoes often feel great in the store but actually running in the shoes is a whole other experience. It takes time to find the right running shoe! In other news, I stepped on way too many sesame seeds in my kitchen the other morning. Seriously. Every single step was another sesame seed under my toes. It seems that my son decided to toast himself a bagel after I went to sleep at night and of course didn’t clean anything up. Note to self: only purchase plain bagels to keep in the house from now on. It’s Okay When What You Eat Changes < – Change is an okay thing! Would You Still Be My Friend If You Knew? < – Well, would you? Even if I am telling you that I am not a friendly runner and can’t tolerate vodka without fainting on the floor? What color are your running shoes right now? Did you have a choice or you had to take what was available for your model? Anyone wear the Saucony Freedom? Please let us know what you think! I really want to try the Saucony Freedoms! A few weeks ago i spilled chia seeds in my kitchen, those were really annoying to clean up. Also somehow I stepped on a frozen chocolate chip last weekend and that was really painful. Dont even ask how a frozen chocolate chip ended up on the kitchen floor because Im not even exactly sure. I need a shoe to rotate with my Kinvaras and I really want to try the Freedom! I actually hope to try them today. I adore the colors of them – Saucony makes the prettiest shoes. I have a pair of grey nikes that I hate. I need to get a new pair. I have been having trouble with my achellis and I’m sure it is do to these horrible running shoes. I have to have 10-12mm heel drops or my calves get trashed! I run in a bunch of different shoes. I have the Energy Boosts too, the Asics Nimbus, the Nike Vomero and the Brooks Launch. I used to only run in the Nimbus but I find that my shoes last longer and my body likes it better when I switch it up! I was recently wondering if what you thought of boosts now that you have had them for a while! I committed a cardinal sin and ran in two pairs of saucony triumphs for too long and the result = achilles pain. I have about 8 pairs of different shoes – triumph, kinvara, zealot and nomad – all saucony and recently added the adidas pure boosts – I am dying to try on the freedom as well and the adidas energy and ultra boosts! I hate the 2 and 3 for the triumph (still hoarding the original iso) and need a good distance shoe. Hoping Adidas fits the bill on that! as a former soccer player all I think of with adidas is cleats so it’s been hard to wrap my head around running in them. I will forever recommend the energy boosts! ive been running in them for over 3 years now – the best ever if you ask me. so cushiony yet light at the same time. I tried the ultra boosts for a few days but didn’t like them so I brought them back. While I don’t wear Saucony shoes, that color looks fun!! the color was awesome! I could use a dog simply to clean up after my son! I am super lucky that I am friends with an athletic wear tester and author so he feeds my running shoe addiction. I am currently rotating through 4 pairs of shoes: Adidas Boosts for long runs and I agree, they are kind of boring, 361s and Skechers GoRun 5s for mid distance, and Skechers GoMeb Speed 4s for speed. I love them all, but the Mebs are probably the prettiest because they are bright pink, purple and aqua. I have gotten over the need to run in pretty shoes though, it’s all about performance and comfort! I agree with you that the Saucony Freedom look absolutely beautiful. Just look at it glow! It’s too bad that the heels are too low for you, but hey, you’ll find another perfect pair. Have a nice weekend! Oh my goodness – so I LOVED the Saucony Freedoms when I tried them in the store. They felt like slippers. I bought them. … I ran in them one day and felt fine while running. Then my heel started hurting a bit.I rotate shoes anyway so the next day I wore a different pair of shoes. Heel was not worse but I could still feel it. Then the next week I did a hard workout in the Freedoms. Then… I couldn’t walk for 2 weeks. Seriously, it felt like someone was hitting my heel with a hammer. Just had to chime in because I think your foresight prevented you from serious heel pain! I read about someone else trying them and also getting heel pain. No idea what it is. I love the look of Saucony’s but every time I try them I get shin splints (random because I am not a new runner!) or this terrifying heel pain. yup! it’s the heel drop! It just means you need a higher heel for your shoes. 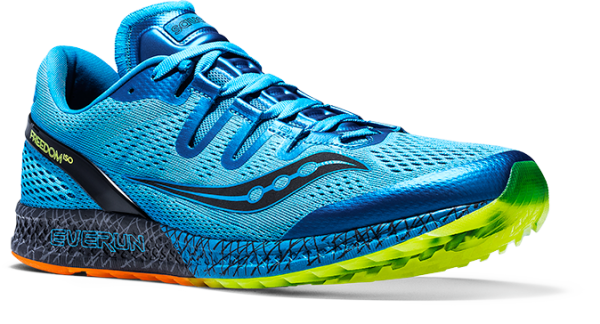 I can wear the saucony rides but the other saucony shoes had been changed a few years ago (maybe more by now, I forget) to a lower heel drop. At first I didn’t know so I just bought my usual shoes but within a few weeks, I had pain in both heels. I brought the shoes back and they told me the problem. This was probably 5 years ago already I think. Since then, I am really conscious of the whole heel thing! If you wear a neutral shoe, I recommend the Energy Boosts. Very soft and comfortable with the right heel for me. You just impressed me with that fancy running shoe lingo. Men cannot be trusted to eat food with seeds without making a mess. It’s something in their DNA.